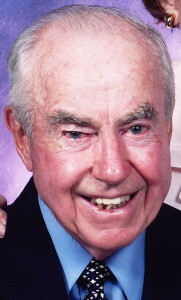 Harold Joseph Geis, age 89, of Brookville, Indiana died Monday, December 2, 2013 at the Brookville Healthcare Center in Brookville, Indiana. Born March 5, 1924 in Brookville, Indiana he was the son of the late Anthony M. & Mary B. (Spaeth) Geis. He was a U.S. Navy Veteran of World War II, having served as a Radio Operator aboard USS Skagit. On November 23, 1950 he was united in marriage to the former Mary Ann Ratz, and she preceded him in death on December 14, 2009. Mr. Geis was employed for many years at Peoples Trust Company Bank, where he was Past-President. He was a member of St. Michael’s Catholic Church in Brookville. He was a loyal fan of the Cincinnati Reds, and an enthusiastic follower of Indiana University Basketball. In his leisure time he loved to play golf and achieved a hole-in-one. Harold also enjoyed music and played the saxophone. Survivors include a son & daughter-in-law, Greg & Pat Geis of Covington, Georgia; a sister, Corinne Johnson of Brookville, Indiana; a brother & sister-in-law, James & Janet Geis of Brookville as well as several nieces & nephews. Besides his parents and wife, Mary Ann, he was preceded in death by a sister Janet Geis Conwell. Rev. Sean Danda will officiate the Mass of Christian Burial on Monday, December 9, 2013, 11:00 A.M., at St. Michael’s Catholic Church. Burial with full Military Graveside Honors by the Bernard Hurst Post #77 of the American Legion will follow in St.Michaels Cemetery in Brookville. Family & friends may visit from 3:00 P.M. until 5:00 P.M. on Sunday, December 8, 2013 at Phillips & Meyers Funeral Home, where the rosary will be recited at 5:00 P.M..